HDfury Linker is a 4K60 4:4:4 600MHz 18Gbps HDMI2.0a Level A capable scaler built for system integrators and advanced users that will please everyone else as well. 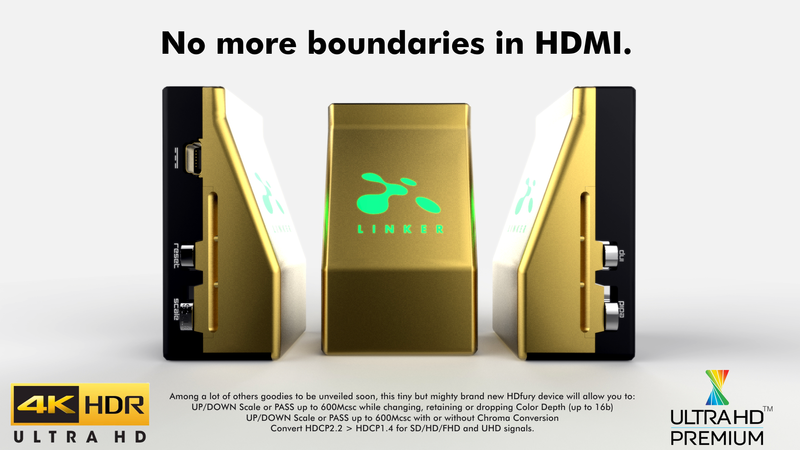 By supporting the max bandwidth and data transfer rate of the HDMI2.0a standard and by offering new scaling modes, options and possibilities to convert and always fed optimum signal through all existing HDMI and HDCP revision, Linker is set to cross all HDMI boundaries. HDfury Linker offers impressive scaling modes to ensure that any HDMI/HDCP revision sink device get fed at its max capabilities ALWAYS and GUARANTEED. Featuring Upscale, Downscale, Passthru and Bypass mode as well as Chroma Conversion and Color Depth modification on the fly at 8, 10, 12 and 16bit for FHD, UHD and DCI 4096x2160p. Providing a total of 4 HDCP 1.4 and 2.2 engines for decryption/encryption, HDfury Linker offers a workaround for HDCP issue including HDCP 2.2 > HDCP 1.4 and HDCP 1.4 > HDCP 2.2 both ways conversion within the same unit. Each RX block decrypts the input first whether its 1.x or 2.x. Then output port can individually encrypts it to 1.4 or 2.2 or not encrypt it at all if it was not encrypted initially. Unlike HDfury Integral that can convert any signals within the 600MHz bandwidth of HDMI2.0a, thus including 1080i, 3D signals, PC signals and all SD/HD/FHD/UHD standard formats, HDfury Linker only support HDCP conversion for SD/HD/FHD/UHD signals up to 600MHz. 1080i, 3D signals, PC signals (except a few manually added) cannot be HDCP converted with the HDfury Linker, they go through in Bypass mode (untouched/untouchable). HDCP 2.2 is the new copy-protection scheme for 4K UHD content.Not only it is not backward compatible but many recent 4K devices don’t even support it. Source devices, including media servers and head-ends like Netflix, will encode their 4K content with this new scheme. TVs must be HDCP 2.2-enabled to play it, and everything in the video chain including switches and receivers must be compliant as well, or the display will go dark and/or display a HDCP error message. Bad news for consumers who have purchased expensive, high-bandwidth, processor-rich switchers, receivers and displays to accommodate 4K. While the newer products may support the bandwidth needs of 4K, they won’t play copy-protected works until HDfury Linker is an active part of the setup. There is chance the HDfury 4K Linker will be able to convert 709<>BT2020, both ways, in the near future but it’s not yet a guaranteed feature. Work in progress. * Not yet available.